Super Bowl security will be reinforced by Black Hawk military-style helicopters and massive X-ray machines designed to scan large cargo trucks, all courtesy of US Customs and Border Protection. On Monday, Customs and Border Protection Commissioner R. Gil Kerlikowske was in Glendale, Arizona, site of Super Bowl XLIX, for a flyover demonstration of the Black Hawks, which will assess air traffic near the University of Phoenix Stadium. The agency has deployed about 100 officers to assist state and local law enforcement, according to AP. The large mobile X-ray machines will allow security to scan for contraband and explosives. The equipment is normally used by the federal agency to monitor the US-Mexico border. 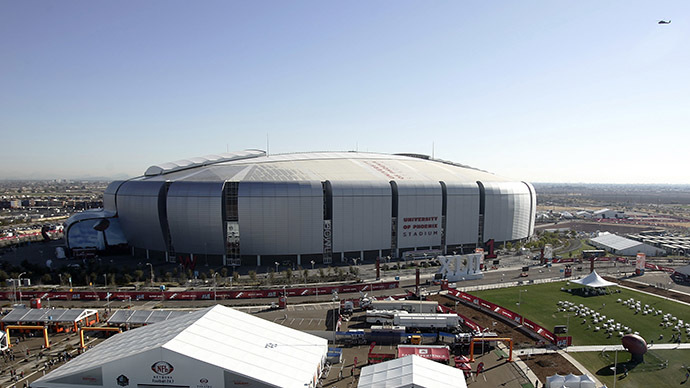 The militarized security around University of Phoenix Stadium amounts to what has become a normal scenario for the Super Bowl, the championship game of the National Football League and most anticipated sporting event in the US. Last weekend, during the NFL’s Pro Bowl game, the Pentagon got one of its first chances to publicly fly the F-35 Joint Strike Fighter, the costliest weapons program in history.